Indonesian recipes may be new to some of us but they are healthy, delicious and easy to make. 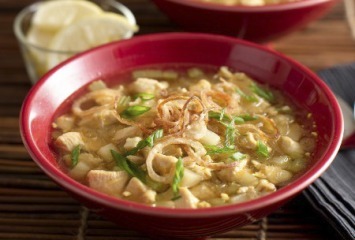 Soto Ayam is an Indonesian chicken soup, with the light and savory flavors that represent that style of cooking. This recipe comes from a wonderful new soup cookbook from The Culinary Institute of America, The New Book of Soups. You just know that if the recipe comes from the CIA, it will be authentic and delicious. We review The New Book of Soups cookbook here. If you like this recipe, I’d love you to Pin it to Pinterest, Tweet about it, Like it on Facebook. Add your own favorite recipes to share below. Indonesian recipes pair well with our Thai Asian noodles. Look here for the recipe.